If you were in Poland and it was making you nervous that you wouldn’t be able to pronounce the above words in Polish at a birthday celebration, do not panic too much. “Sto Lat” is often accompanied by vodka, which somehow makes the pronunciation much easier! So why am I writing this post to you today? It was on September 27, 1917, that a little baby boy named Stanley was born to a polish immigrant couple who settled in Lynn, Massachusetts. Stanley was the youngest of 7 children and if he lived to this very day, Stanley would have reached that 100 Year “Sto-lat” landmark. This man Stanley that I am speaking about was my dear Dad! Unfortunately, my Dad did not live to be 100 years old. He went to heaven peacefully on January 9th, 2009 (about 8 years ago) at the age of 91, while in the comfort of his home. On that very morning just before he passed, my parents had pre-arranged for a visit from their lawyer to their house to sign their updated last will and testament. Ironically, in just less than one hour after the attorney left my parent’s house, my Dad simply sat down on his favorite chair and moments later—- his heart just simply stopped. My Dad was such a wonderful person who was loved by all. He never complained and rarely talked much about himself. When you would meet him, he genuinely was interested in you and your welfare and would take the time to listen intently to what you had to say. My Dad was the kind of person who loved his wife and family deeply, who was proud of his three sons, and who would always speak from the heart. I really miss my Dad even after all these years. However, I am comforted to know that he is at peace and that he continues to lovingly watch over us (his family) from his rightful place in heaven. “Sto-lat” “Sto-lat” my dear Dad ——- you finally made it to 100 years ! “Sto-lat” !!! Unfortunately, unlike Terry’s Blog I do not have many current pictures of my Dad here with me in my RV in Tampa. 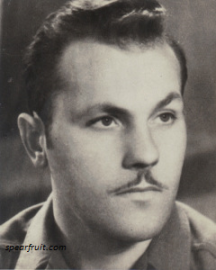 However, I incorporated into this Blog a photo of my Dad (in his younger years) that you might recognize since it was previously used by Terry as the main character in a couple of his creative short stories. 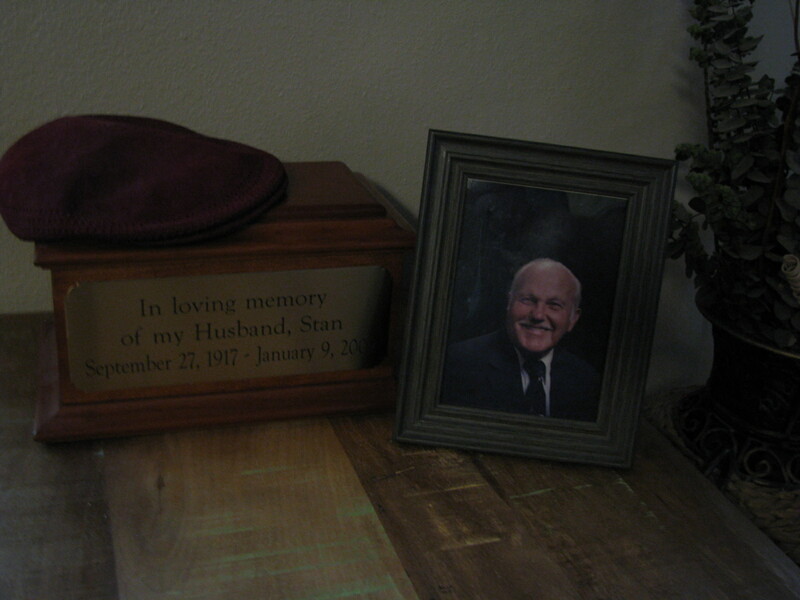 Also included is the only video that I have of my Dad probably taken about 10 to 12 years ago and a photo although a bit dark of his Urn, favorite hat and a photo of my Dad’s smiling face proudly showing “The Drabczuk smile”! From my mother Stacia (his wife): What can I write about my husband? He was the best thing that ever happened to me. I’m sure glad I accepted his New Year’s invitation to go on a date when he called me on Christmas Eve in 1947. That was the beginning of it all. In May of 1949, Stan and I married. He gave me 60 years of the happiest times of my life, but most of all he left me with three wonderful sons – Jan, Gary and Randy. From my brother Jan (his oldest son): Growing up I always remember that my Dad was there for me. He would come home usually after working overtime and he still had time for me. He was there for both my happy and sad times. Dad gave me the direction, education and love that has made me successful in life. Every day I wish I could be more like him. Wish you were still hear Dad. Happy 100th birthday. From my brother Randy (his youngest son): I can’t believe my dad would have turned a 100 years old today. I also can’t believe it’s been over 8 years since his passing. Not a day goes by that I don’t think of him. He was a wonderful father, husband and man of this world. He was a friend to all that knew him. My dad was the type of guy that could walk into a room of strangers and then walk out of that room with every one of those strangers becoming his friend. He made everybody laugh. Growing up with my dad provides me with some of my best memories in life. He was always supportive of me and encouraged me to excel in everything I did. No matter how busy he was with working extra hours to support our family, he would still find time in his schedule for me and that made me feel special. From the simple things in life like coming up to tuck me in bed when I was little or the difficult things like coming to the hospital when I was in a car wreck, I could always see in my dad’s eyes how much he loved me. Even as an adult, when I went back home to visit, I could always feel my dad’s love. I only wish I could be half the man my dad was. I love my dad, I miss my dad and I wish my dad a Happy 100th Birthday! From my sister-in-law Gail (my brother Jan’s wife): Stanley was always a lot of fun and happy to see anyone who walked into his home. He made everyone feel welcome and could not wait to chat with you. He made me feel like part of the family from the first meeting. I will always love and miss him as his daughter in law. He will forever be missed. From Terry (my deceased spouse, written several months ago): Gary’s father is now gone from this world, and I only had the opportunity to be in his company twice. From the memories of Gary and his family and the short time I knew him; he was an extremely patient, funny and easy-going man. A son, a brother, a husband, a father, a respected man. He is missed and now a memory, but he is not forgotten. Because I will be spending time with my twin sister this weekend, I decided to take it easy here on WP. So, the news of my cancer spreading and growing was received on a Friday; and Saturday Gary made a couple of calls. He called my twin sister and he called my stepmom. Why call these two family members? My stepmom is the caretaker of my dad who has Parkinson’s Disease. My dad’s health has deteriorated a great deal in the past couple of years. At times, it is very difficult to understand his speech and because of the medications he is on; he sleeps a lot. My stepmom has been a part of the family for over 30 years and is in contact with my siblings. Gary knew in talking with her, she in turn would talk with my siblings. My twin sister, being the only female sibling, has a close relationship with my mom – they live in the same city. Gary did not want to call my mom directly as he was concerned about upsetting her, plus a sensitive matter was to be discussed and Gary felt it coming from her daughter, my twin sister would be better received from mom. Do you remember Father’s Day weekend? My 3 sons surprised me with a visit that weekend. It was an emotional weekend for all of us as we chatted about my current health situation. I was honest with them and they know the seriousness of my cancer and the ways it is invading my body and what we are doing to fight back. They saw me at my worse; just a shell of a man who is weak, but still strong. You can read more about our special weekend in my post ‘Father & Sons‘. A couple of weeks after my son’s visit, my dad and stepmom came to visit. They spent a week and I had many special moments with my dad, moments I will not forget. You can read more about their visit in my post ‘Chats, Tears & Love‘. My sister and I are twins and therefore we have a special bond. I believe if that bond were broken in anyway, there would be a great loss there. My sister has revealed to me she is heartbroken and upset. What was discussed in these phone calls? Gary was honest and sincere and direct. He was caring and sensitive and calm. He called these 2 people to let them know the truth concerning my current health situation. He told them I am in a great deal of pain to the point I am using a cane to help me walk. He told them I have lost almost 40 lbs. and my appetite is not always the best. He told them the results of the latest scan. He told them what is to come with regards to my future treatment and the slim possibility of positive results. He told them more than likely we would not make it to Texas for Thanksgiving. He told them he felt it important that they (my family) consider making plans to visit me here in Florida. You remember last month on Father’s Day weekend, I received a surprise visit from my 3 sons? My heart was happy and the time spent together that weekend is priceless. It was by far the best Father’s Day I have ever had. I just recently had more visitors that left yesterday after a weeklong visit. My dad and stepmom drove from Texas to come visit me. The time spent with my dad was special and I feel a closeness to him I have never felt before. We chatted about our relationship and the mistakes we made along the way, and the love we have for each other. We talked about my current health situation and we cried together and he provided me support only a dad can. The weeklong visit was fun, special and very emotional and one I will never forget. My dad has Parkinson’s that has progressed in recent years; he is lovingly taken care of by my stepmom. She is an amazing lady, who I have great respect for. I know my dad is in good hands with her, just like I am in good hands with Gary. Thank you dad, for taking the time to visit me.